From listening to your favorite song to hearing noises go bump in the noise, your ears are a valuable organ — and one of the most sensitive. Unlike your eyes, which can get Lasik to improve vision, you can’t quite repair lost hearing. If you’re the type to love shooting guns, you have to protect your hearing on the range. While there’s a lot of options to choose from, we’ve narrowed down the choices to the top five ear protection devices for shooting. Time to go back to your high school anatomy class. Why do you think you have something called an eardrum? Because it’s precisely like a drum instrument — and as delicate as one too. Sound waves reaching your ears cause the eardrum to vibrate, which emits vibrations to the inner ear through a series of bones. It’s like of like an auditory Rube Goldberg machine. The vibrations from the inner ear bones reach the cochlea, a fluid-filled chamber that contains thousands of small hairs. The fluid inside the cochlea vibrates and makes the hairs move. Strong sounds make the hairs move more. So, imagine there are tiny grass blades in your ears, and sound is like the wind blowing over them. The slightest gust of wind will make the grass rustle, but too much wind and the grass will tighten up and not rustle so much. The same happens to the hair in your ears. Listening for too loud of sounds for too long will make the hair in your inner ear grow less sensitive, which is why you have temporary hearing loss after you’re exposed to loud noises. Lucky for you, the hair cells can recover, but only for so long. With consistent exposure to loud noises, the hair cells never recover, and you lose some of your normal hearing functionality. The grass blades just stop moving altogether, and it takes a very strong gust of wind to get them moving again. Unlucky for you, no cure exists to repair a damaged inner ear. The best remedy is to not have the malady at all. That’s what you think. As described earlier, your ears are capable of recovering some of its functionality if you give your ears enough time to rest. But think about it: our technology has vastly outgrown the evolutionary conditions our ears were sculpted in. A lion’s roar, for example, is about 114 decibels, whereas a gunshot is about 140 decibels, according to the American Speech-Language-Hearing Association. Let us remind you that any noise at or above 85 decibels permanently damages hearing. 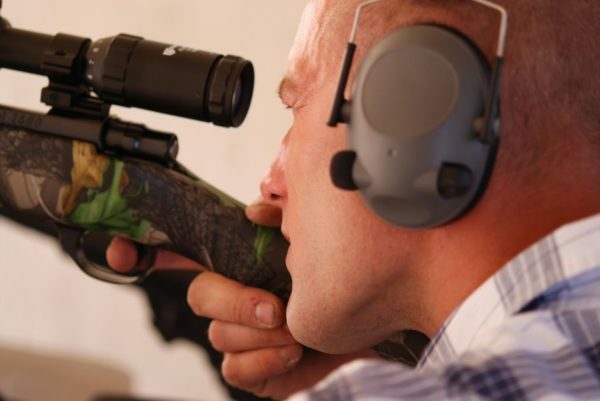 While you think you can brave a trip to the shooting range without hearing protection, you’re putting your hearing at great risk. The ear was not meant to recover from such loud noises. Convinced you absolutely need hearing protection? Great, let’s keep going. Ear protection ranges from pocket-sized to bulkier sets. Below are some of the most popular choices. These are inexpensive bullet-shaped pieces of foam that can be rolled with your fingers and stuck in your ear. You’ll find foam earplugs anywhere there are loud noises, such as at concerts or construction sites. While they’re nearly universally available, they also provide some of the weakest protection to loud noises since they’re so flimsy and cheaply made. Worse, if your fingers are dirty when you roll and insert the earplugs, you risk getting an ear infection. Foam earplugs are also strongly discouraged from being reused. Their single-use nature means you’ll have to constantly keep buying them to get rudimentary ear protection. It would be best to invest in long-term ear protection, especially if you plan on habitually shooting a gun. Wax balls completely seal off the ear. It feels as if you’ve stuck a finger in your ears, but your fingers are made of sound-sucking lead. It’s like you’re completely deaf. Wax balls are also cheap protection from noise — a little more expensive than foam earplugs, though. You can only use them once, so they aren’t sustainable if you’re a habitual gun shooter. These are in-ear protectors that can cover the ear canal rather than be inserted inside it. They’re likely to fall off the ear, but they’re more effective than foam earplugs and don’t feel like you’re cut off from the world like wax. Also known as headphones. These devices are made of two foam bands that go over the ear rather than inside it and are connected by a band placed on the top of the head. Headphone style ear protection is a long-lasting investment for gun shooters, as top-tier earmuffs can provide total soundproofing abilities. While they’re the best performing sound protection, they’re also the clunkiest to carry around. All the other models can be put in your pocket or carrying bag without taking up too much space, but the same cannot be said for earmuffs. Still, size definitely matters with how well earmuffs will protect your ears. You could shoot a bazooka at the firing range and there would be an earmuff out there that would perfectly protect your ears. With the types of ear protection out of the way, let’s check out which products will best protect your hearing on the firing range. Walker’s Razor Slims provide not only reduced noise control but increased noises as well. 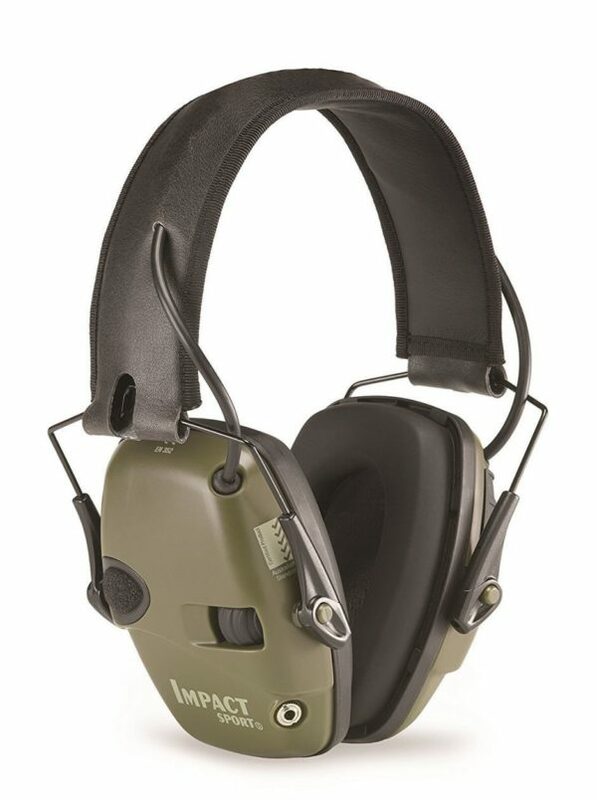 If you want to take these ear muffs hunting, you can protect your ears while finding your next target. The ear muffs come with volume control on/off switch with raised ridges, which means you can alter the volume even while wearing gloves. The high definition speakers embedded in the muffs deliver clear, crisp audio to your ears. Should you want to pass the time while out in the field, you can hook up a 3.5 mm headphone jack to listen to tunes while you intermittently shoot your gun. The earmuffs require two AAA batteries to operate. The headphones have long battery life. The comfort headband adjusts to accommodate all head sizes, and the soft padded design provides all-day comfort. Overall, these are high-performance yet affordable headphones that provide all-day comfort while reducing noises to 23 decibels.lker’s is one of the top protection earmuff companies around. Both reduced and increased noise functionality. Built-in headphone jack to listen to music. Slim folding design for compact storage. Seal from the earmuffs broke with glasses, so it’s hard to wear eye protection/vision glasses while using the Walker’s earmuffs. Omnidirectional noise functionality is a lot harder in practice. You sometimes can’t tell where a noise is coming from. Can’t talk or move jaw too much while wearing these headphones, as jaw movement breaks the earmuff seal and affects performance. 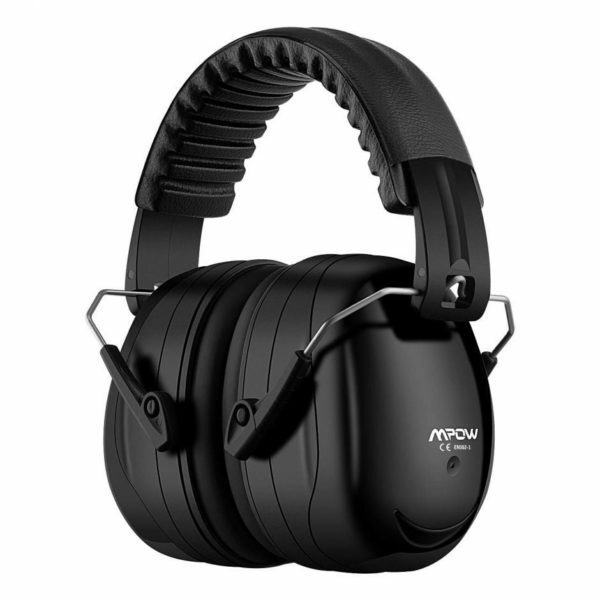 The Mpow 035 are by far the cheapest ear protection on the list. 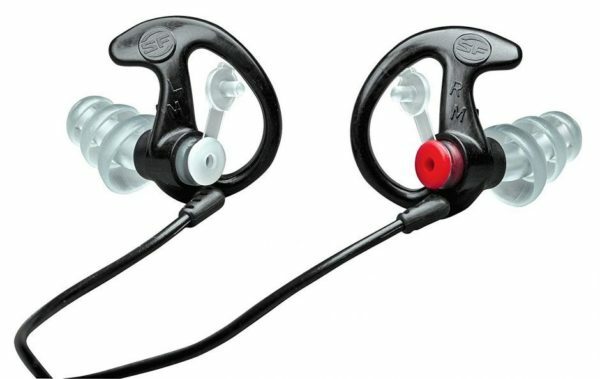 Despite its low price, these headphones don’t sacrifice performance. The Mpow 035 has two layers of professional noise dampening foam, which means you get maximum noise absorption before sound reaches your ears. The high sealing solid cup and double shell shape further dampen noise to 34 decibels. These earmuffs are tested and certified to be professionally protective during hunting season or shooting at a gun range. While ideal to be used around guns, the Mpow 035 can also reduce noise at concerts, loud sporting events, while studying, or to help you go to sleep easier. The retractable stainless-steel-equipped headband stretches to fit all head sizes, and further folds to collapse into the headband. There’s an included drawstring bag upon purchase for easy, dust-free storage. Sealing solid cup to protect noises from sneaking in. Depending on your head shape, these earmuffs may be uncomfortable to wear for an extended period of time (about 30 minutes onward). We’re taking a break from the earmuffs to bring you a cool earplug design. I’m a person with awkwardly shaped ears. I can’t use earbuds to listen to music because I guess my ears are shaped like a Picasso painting and every bud slips out. But luckily, molded earplugs exist. The process to mold the plugs to your ear is simple. Boil some water and throw one plug into the water for about five minutes. Take the earplug out, let it cool for a bit, and stick it in your ear. Mold the plug to your desired shape, and do the same with the other plug. If the plugs look wonky, you can always put them back in boiling water and remold them. It’s custom designed earplugs for even the most Picasso-esque ears. The silicon padding inserts into the ear canal, which means there’s not only a seal around the ear canal blocking noise, but one in it as well. Silicone earplugs are reusable as long as you wash them often, so you can get years of use out of the Decibullz Custom Molded Earplugs. Unlike with earmuffs, you don’t have to worry about headbands getting in the way of wearing hats or other on-head paraphernalia while still protecting your ears. Moldable earplugs creating a seal around the ear canal. The foam ear-canal insert may be difficult to insert after the earplug has been molded. Molding may be hard to master. Not only are the Howard Leight earmuffs stylish, but I think they’re a great pair of ear protection on the shooting range. The built-in directional microphone amplifies some noises on one setting while reducing ambient noise on a different setting. If you forget to change settings while a loud noise goes off, the earmuffs will automatically reduce ambient noise to below 82 decibels, near the threshold for hearing loss. Includes a 3.5 mm AUX input that lets you listen to MP3 players. The headphones require two AAA batteries to function. To further save battery power, the Howard Leight headphones will turn off after 4 hours of no use. These headphones will aid you in the shooting range or out hunting. The slim ear cup keeps your ears warm while reducing noise, and the amplified or dampened ear noise protects your ears from damage or boosts their abilities beyond what the normal ear is capable of. Amplified noise or noise reduction at the flip of a switch. Included AUX cord lets you listen to music while using headphones. Automatic shut-off after four hours boosts battery life. Best if used for outdoor ranges rather than indoor ones. Noise reduction capabilities weaker than other ear protection on this list. Another pair of earplugs. While these aren’t moldable, they’re silicone and incredibly convenient. The earplugs are attached to each other by a thin stream of silicone, so they won’t get lost from one another like the Decibullz earplugs could. You’d want something easier to find as a forgetful person, and the SureFire earplugs provide in-ear noise cancellation while minimizing the probability of being lost. The SureFire earplugs have triangle-flange stems that seal the ear canal. The silicone isn’t going to shift around and let noise in when you move your head, so you can wear these earplugs all day and not hear a stray sound. With seven contact points, the earplug isn’t likely to fall out during use. It will stay in place until you decide to pull the plug. The SureFire earplugs are made in the USA from a hypoallergenic, medical-grade polymer, meaning the earplugs will be soft and durable. Small size while less likely to be lost (unlike Decibullz). Triple-flanged stems to ensure a seal in the ear canal. Retention ring with seven points of contact keeps earplug in place, preventing it from slipping out. Can be worn for multiple hours without causing ear fatigue. Falls apart if abused or after long periods of use. Difficult to insert without lots of practice. I’m not going to assume one kind of ear protection is going to fit all scenarios because you could want over-ear protection for heavy-duty noise cancellation or in ear-protection for aesthetic/storage purposes. I’ve chosen two best products from the above category. 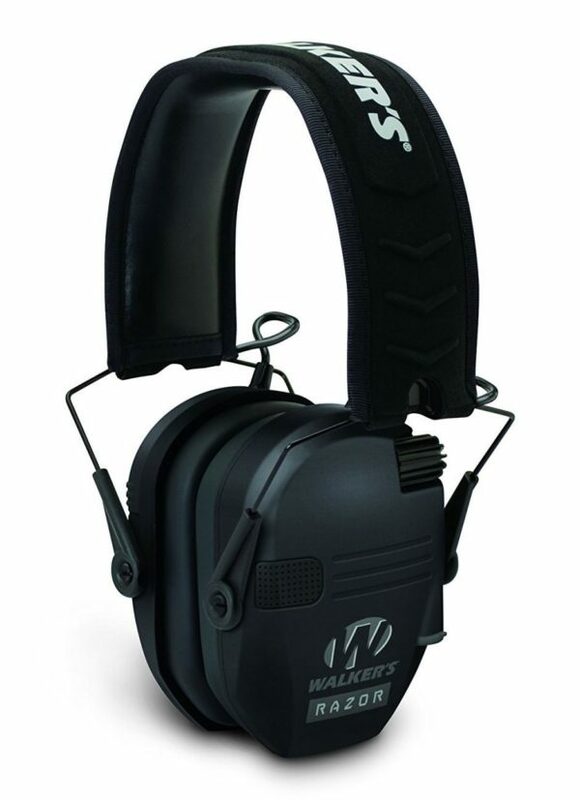 For earmuffs, I recommend Walker’s Slim Razor Edge earmuffs. The stylish design houses an affordable pair of headphones that protect your ears on the shooting range while proving other nice features like noise amplification and music potential. 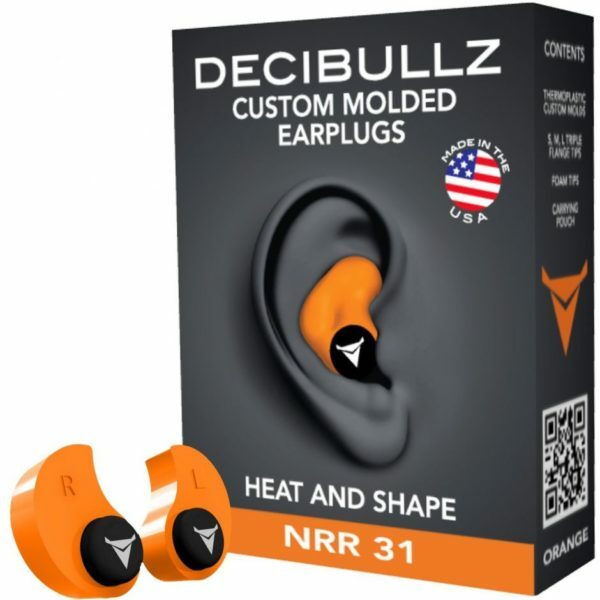 The Decibullz Moldable Earplugs is our top choice for in-ear protection. The possibility to mold earplugs to your specific ear shape is too good to pass up. While they may be easy to lose on their own, the molding ability allows you to attach a string to the plastic to reduce your chance of losing these earplugs. There are lots of different ear protecting inventions on the market, but not all of them are actually going to protect your valuable hearing. When hearing loss is a permanent endeavor, investing in the proper ear protection now prevents frustrating hearing loss in the future.